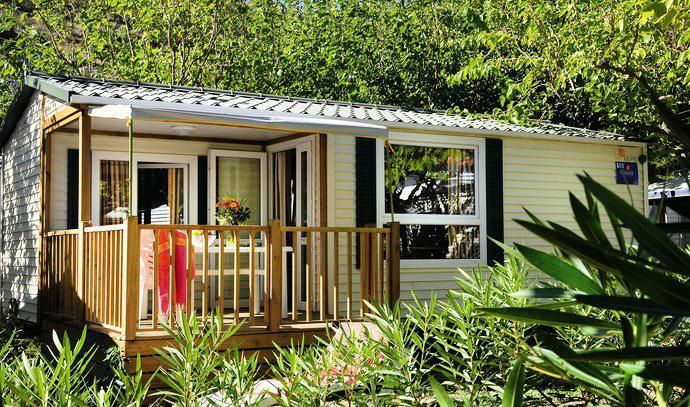 In a vast area of 17 hectares planted with holm oaks, in the heart of the Verdon, discover the Camping Les Lacs du Verdon **** which opens its doors in a natural setting for holidays with family or friends. On site you can enjoy a complete water park (from 01/04 to 24/09) with heated outdoor pool, double track slide, aqua-play area, large relaxing hot tub and a large solarium ... what to relax and enjoy the sun! In July / August, enjoy aquagym, swimming (paying), fitness or even muscular awakening to keep you in shape. Throughout the season, you can also participate in sports tournaments and petanque competitions (1 / week). After a busy day, find yourself in the evening around shows, themed meals (1 / week), dance evenings or karaoke. You will also find a craft market where you can find local products. The Children's Club and the team of animators welcome the youngest of 6/12 years (in summer) to offer them a swarm of memories, more funny than the others. On more than 600m², slide, observation tower, swing, giant hammock, suspension bridges ... they will not want to leave! In order to make your stay as pleasant as possible, the campsite gives you access to its brand new bar-restaurant-snack with its new decoration (open all season). As teens often have trouble "disconnect", WiFi is free near the reception so they do not lose contact. For lovers of sensations, take the height in a paragliding baptism, thrills and unforgettable moments guaranteed! You can also walk to the Gorges du Verdon nearby or go down in canyoning or canoeing. Discover the region, from the Alpilles to the Luberon, you will be charmed by its colorful markets, vineyards and beautiful landscapes. Air-conditioned cottage 3 rooms 4/6 persons of 27m ² approximately, composed of a corner living room with a bench bed for 2 people, a corner cooks equipped, a room with a double bed (140x190), a room with 2 single beds (70x190) and a bed in height, a shower room, WC and a terrace / balcony. The Cottage includes a kitchen area equipped with 4 burner gas hob, fridge-freezer, coffee maker, microwave, cooking utensils and crockery adapted to the number of people in the housing. The terrace has a garden furniture. Pillows and duvets are provided for each bedding (optional sheets). Note: The dimensions of the sofa-bed make it impossible for people over 15 years old to sleep. & Nbsp; & nbsp; & nbsp; & nbsp; & nbsp; & nbsp; & nbsp; - TGV SNCF station & nbsp; "les Arcs Draguignan"